Jennifer Hudson’s broken headline has been interpreted as being caused due to the shock of a personal tragedy (the murders of her mother, brother and nephew) and perhaps it is so. However, as her Headline does not break at the precise time when the tragedy took place (age 27), the answer is a bit more complicated than that. several years until after the personal tragedy in her life, maybe until the age of 29 or 30, although it appears to start to fade a few years earlier, probably around the time of the tragedy. The other Headline (or broken part) starts significantly below it, showing a different personality type. What this means is that Jennifer did not change overnight. It is known that within some months of the personal tragedy she pushed herself to continue with her career and this is no doubt due to her ambitious nature as well as her mental strength (Mars). A link to Jennifer's hand photograph is here. This second Headline or the overlapping part of the same Headline starts around the age of 29/30, and slowly strengthens in her early thirties. It is possible that it starts earlier but the line must be very faint and is not visible in the hand photo. This Headline shows a different personality, a far less materialistic person, although not extremely so. It was the other Headline which showed an excessively materialistic approach to life and the second Headline is better balanced, showing pragmatism and common sense. Unfortunately, this new Headline is not as strongly marked as the previous one. This means less focus and ambition as compared to what she had earlier. Generally speaking such drastic changes in personality are not good because they show the person going against the basic nature. While I cannot comment about the future trends without seeing Jennifer's hand lines better, what I can say is that a Headline like that does not bode well. There must other reasons (other than the family tragedy) for the change in her personality. One does not know what is going on in her personal life or the struggles she has with her career. From Jennifer’s Jupiter and Mercury fingers I can additionally conclude that Jennifer is not high on self-confidence, and nor is she good at assessing people. She has average intelligence although she has significant talent, business sense and expressive ability. Her talent may not be in the realm of brilliance, but it is distinct and strong. Jennifer also has a tendency to be moody, and some amount of morbid thinking could trouble her. However she is not a depressive personality. (Jennifer Hudson is an American recording artist and actress). 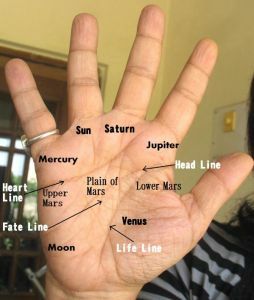 Related Reading: The hand analysis of music star Maddona or Beyoncé Knowles - hand reading or Rihanna's hand reading or You might also like to read about Justin Beiber or Lady Gaga. Or check out the label "Music Stars"
I have not heard of this person before, but why does basic character change after a tragedy? I mean, it could have a short change but does it continue even after things are normal? Is there any other personality whose hands have changed dramatically after a tragedy? DI, this is not common and shows something a little odd in the personality and that is why I said it is not good. What is more common is that the basic personality changes in early childhood due to traumatic events and this usually produced a different (than intended) personality but a stable one. But changing in adulthood is uncommon and it is like going against one's own basic nature and I do not think its good for balance of personality. I personally know someone whose hands changed like that after a traumatic event and it causes a person not to be fulfilled or satisfied at the end of the life. hi, I follow your blog regularly and I got a bit inquisitive...I know someone whose lines on the hand are very light...while some people have clear seen lines like I do...that person is fair coloured. is there a reason to it? Light lines (as compared to the size of the palm) definitely have a meaning. However one has to see how light, whether they are light because they are broad or light because they are shallow. Also at times some of the lines are light, and one line is deep. There are different meanings to it, depending on the line which is light (in comparison to the palm). I cannot generalize. The determination of a low-set finger and a high-set finger can be told when the fingers are held together close. In this case the horizontal gap between the fingers cannot be seen. When we talk of low-set, we talk of a vertical gap. Also, when it comes to recognizing low-set or high-set, I myself struggled with this for some years. Some fingers are naturally a little low-set like the little finger and some fingers are naturally a little high-set, like the middle finger. It is my experience that after reading scores and scores of hands, specially of people you know, that you come to know whether the reading is correct. My advise to you is, collect that hand prints of all those whom you know really well, and then check to see if the traits you see on the hand match with what you know. Please don't go by what the ancient palmists said. We don't do that when it comes to other subjects do we. I mean read ancient authors. About robin williams, yes I remember. I think I did look for photos of his hand. I am not sure why I didn't read his hand. At times I am not satisfied with the photos of his hand, and at times I just don't feel inspired to read that person's hand. I will look at Robin William's hands again and see what I can do. i was just wondering if you can do a quick reading of te singer Rihanna , i've found some really clear picture's which looks kind of interesting. thanks for the suggestion vicky. I shall take a look at the hands. I am afraid to call this a planned murderers hand based on my rich experience in palm print analysis was she behind the murder of her family along with her ex-husband Balfour if I am correct.The case against Balfour was built largely on circumstantial evidence, with witnesses testifying that the shootings were the final chapter of a story that was laid out to them by Balfour himself in alleged threats that he would kill Julia Hudson's family if she spurned him.May 10 born Balfour by birth number 10 will be patient but at times liable to sudden outburst of temper and passion if if opposed in his plans and it will not be an easy matter for him to stand interference of any kind petty annoyance or criticism. Those brain line goes up towards heart line indicating a materialist with heartless temperament.She is having a dual mind and role just escaped.